The heist is a popular plot, from the lone hobbit sneaking into a dragon’s lair to a well-planned robbery with military precision. The core requirements for a heist are the thieves, the target, and the victim. To play up the thieves, either the victim is engaged in a shady business or the target is a supposedly impossible to break into location. 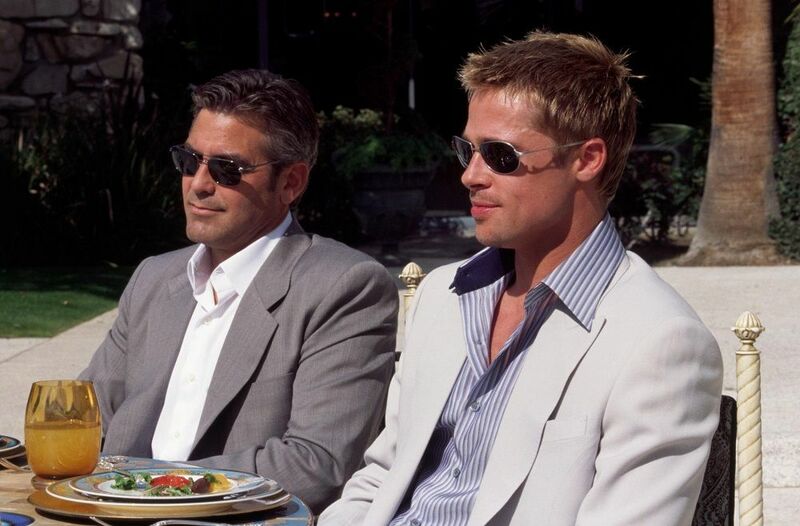 With the original Ocean’s 11, it was a mix of the two. 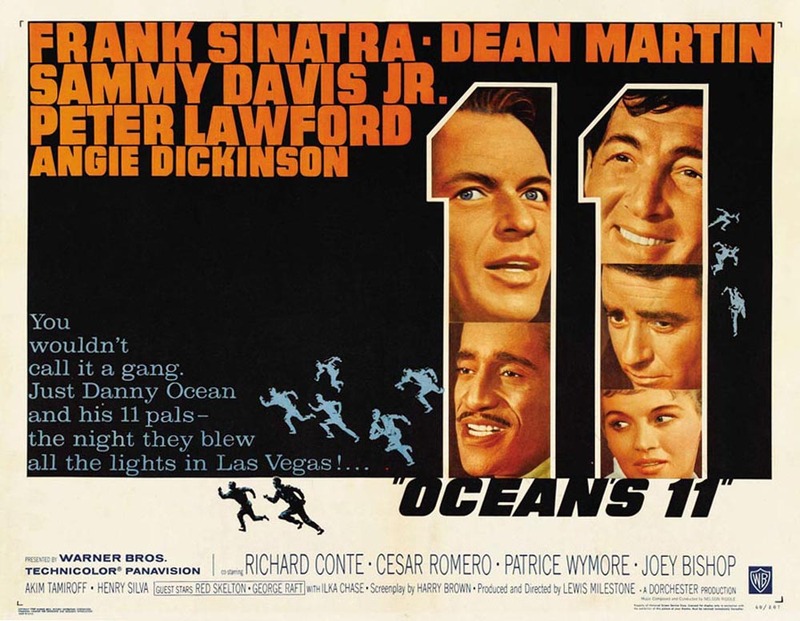 Released in 1960, Ocean’s 11 featured Frank Sinatra and the Rat Pack, who essentially decided to make a movie together for the fun of working together. 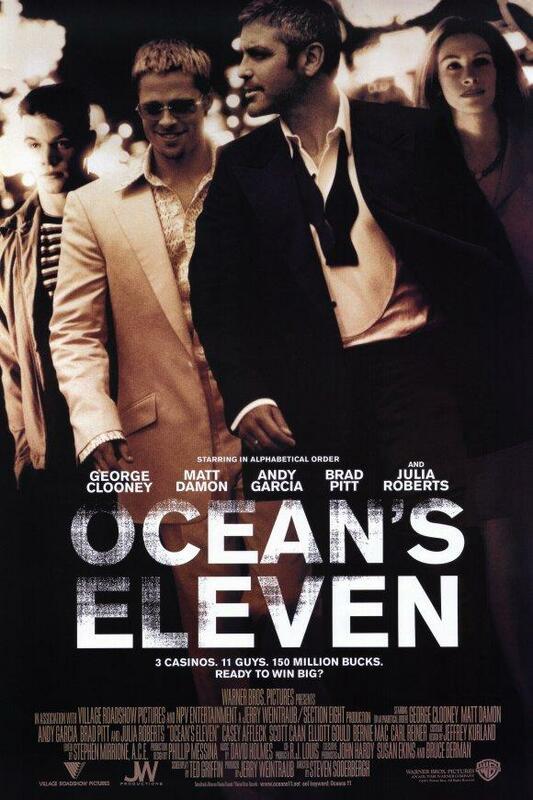 The work they chose was Ocean’s 11, based on the story by George Clayton Johnson, who also wrote Logan’s Run. The story was published the same year as the movie’s release, and appears that film and book were meant to complement each other. This creates an interesting situation. Normally, I would, but it was while watching Ocean’s 11 that I discovered it, too, was an adaptation. That said, for the purposes of the review, I’ll just focus on the movie. If I can find the book, I’ll take another look at Ocean’s 11 with an eye on the movie being the adaptation. Back to the movie, Ocean’s 11 starred Frank Sinatra, as mention, as Danny Ocean, a former sergeant in the 82nd Airborne. He is offered a job by Mr. Acebos to perform the heist of a lifetime, the robbing of five Las Vegas casinos on New Year’s Eve. Ocean pulls together his former squadmates in a manner similar to Seven Samurai, giving the audience time to meet each characters, including his former lieutenant, played by Peter Lawford, squadmate turned entertainer, played by Dean Martin, squad’s driver Josh Howard, played by Sammy Davis, Jr, and electrician Tony Bergdorf, played by Richard Conte. Bergdorf initially refuses the job; he’s just fresh out of San Quentin and wants to spend time with his son. However, a visit to the doctor reveals that he has cancer, so Bergdorf agrees so he can get money to help his son’s future. Bergdorf does warn that his luck is sour and could cause problems for the rest of the team. At the time of filming, January 11, 1960, Las Vegas wasn’t the neon-lit monument to gambling that it is today. The Strip, where the five casinos Ocean was going to hit, was only on one side of the road; the other side was desert. Hotel rooms were separate from the casinos, and the entertainment areas were more intimate. The five casinos, the Sahara, the Riviera, the Desert Inn, the Sands, and the Flamingo were the main casinos in town. None had the surveillance then that they have today; electronic cameras watching everywhere, electric access control, and fail safes that locked down the cash are innovations that came after Ocean’s 11. Ocean introduces the plan to hit the five casinos. Howard gets a city sanitation garbage truck and is the one who will pick up the loot. The remainder of the 11 split into teams of two; each team infiltrates, in one form or another, one of the five casinos. Harmon performs at one while others, like Borgdorf and Peter Rheimer, played by Norman Fell, dress the part of employees. The insiders spray paint that can only be seen under black light with special glasses, marking the areas that they’ll need to go to get the cash. Explosives are set at an electrical tower and in each of the casinos’ backup generators, ensuring the lights will be out long enough. At the stroke of midnight, as “Auld Lang Syne” plays, the lights do go out and the casinos robbed. The loot is placed into bags that are then dropped in the garbage where Howard picks them up. Borgdorf’s luck sours as he tries to get to the rendezvous with Ocean and Harmon. His health takes a turn for the worse and he drops dead in the confusion. Police have been called by the casinos, stretching out the officers to the point where roadblocks are set up to search cars that are leaving. Howard gets stuck in one, but is told to keep going. The stolen cash rides off in the garbage truck under the noses of the police. The next day, Mr. Acebos reads the paper and has a good laugh; millions have been stolen from the casinos and cannot be found. In Vegas, Ocean’s crew tries to figure out their next move. When Borgdorf’s wife is seen, they get the idea to have the money leave with him in his coffin. A late night break-in at the mortuary later, the loot is placed in with Borgdorf, with $10 000 ($79 268.36 today) kept aside for his son. Borgdorf’s wife, though, decides that she doesn’t want to transport the body for burial and has the funeral in Vegas, followed by a cremation. The commentary for the film, provided by Frank Sinatra, Jr, indicated that the ending had been changed from the original in the story. While the money did get burned in the original story, the ending featured a plane crash instead. Jack Warner, CEO of Warner Bros, didn’t like the end implying that Ocean and his crew died and ordered a new one written. In the time between the release of Ocean’s 11 in 1960 and Ocean’s Eleven in 2001, both security and Las Vegas itself had changed greatly. Vegas, while still in the middle of the desert, grew. Casinos and hotels merged into one building, the space for shows increased, the sheer amount of square footage dedicated to gambling expanded, and the nighttime was lit as bright as day from the lights along the Strip and other gambling locations. Security embraced the silicon chip, allowing for computer controlled access, cameras in every possible location, background checks on employees becoming the norm, and laser grids. The heist pulled off in 11 would not be possible in Eleven. The remake, Ocean’s Eleven brought together several of Hollywood’s biggest stars together. This time around, George Clooney played Danny Ocean. Instead of being a veteran of World War II, Clooney’s Ocean is a con man getting out of prison after a job ended badly for him. First thing he does is build a small bankroll through gambling, then he recruits Rusty Ryan, played by Brad Pitt. Just as 11 and Seven Samurai, Eleven shows the recruiting of the team. Instead of fellow veterans, the new Danny rounds up nine more criminals, from grifters to contortionists to even a demolitions expert to rob the Bellagio, the Mirage, and the MGM Grand, three of the most profitable casinos in Vegas at the time. The three are also run by Terry Benedict, played by Andy Garcia, a vindictive man who doesn’t settle for just re-arranging kneecaps when he can destroy a life instead. The group studies the floorplan of the casinos and the central vault, planning on completing the heist during a championship boxing match. The expected take is over $150 million. Eleven shows the work the team does to set up the theft, from determining the timetables of guards and cash pick up to Benedict’s personal routine. The latter is assigned to Linus, played by Matt Damon, who finds out Benedict has a girlfriend whose name Lunus can’t discover. Rusty, however, does know her name – Tess Ocean, Danny’s ex-wife. In the original 11, the heist was a challenge, rob five casinos at once during their busiest time. In Eleven, the stakes are more personal, at least for Ocean. Rusty tries to have Danny sit the heist out, but Ocean has other ideas. The plan continues, despite small problems that get in the way, including Benedict having security follow Danny. Ocean’s team take advantage of the confusion, helped by Basher, played by Don Cheedle, and his EMP bomb taking out the power during the boxing match. Ocean’s Eleven is a great example of how the progress of time affects a remake. In 1960, most Americans would either be a veteran or know of one, from either World War II or the Korean War. In 2001, without compulsory enlistment, there weren’t as many veterans of the Gulf War and the Vietnam War was almost thirty years in the past. A squad of veterans breaking into an installation better guarded than Fort Knox would take a direct approach. A team of grifters and con men, on the other hand, uses a more delicate touch. With the leaps in security technology, the heist had to become more sophisticated; the weak spot is always the human element. The march of history may change the details from 11 to Eleven, but the core element remains; the heist by a team dedicated to pulling off the impossible. The gathering of the team, the showing of the preparation, and the actual theft were in both films. The biggest change comes from what happened to the money. In /11/, Ocean’s squad ran the heist as a challenge, with Duke Santos coming in late as the opposition. As a result, cinematic karma required that the money be lost; Ocean’s squad had dirty hands. Only Bergdorf’s son, the innocent, got to keep any of the stolen cash. Meanwhile, in /Eleven/, while several of Ocean’s recruits were along because of the challenge, Danny’s goal was to cause financial harm to Terry Benedict, the greater evil. Thus, the money got split amongst the Eleven and Tess found out exactly what type of person Benedict was. Next week, the September news round up.